Complimentary bicycle parking is available inside Sea Pines at the tennis courts next to the Harbour Town Golf Links Clubhouse parking lot and near the 13th green. Owners are responsible for locking their own bicycles. All cyclists must have a Tournament ticket or a volunteer badge to be admitted through the gates of Sea Pines. Cyclists may enter Sea Pines at the Ocean Gate on South Forest Beach Dr. or at the Main Gate on Greenwood Drive. Bicycle parking is also available at 16 Baynard Park Rd. Handicapped parking passes are issued by Sea Pines Security, located at 175 Greenwood Dr. in the CSA/Security Administration Building. Passes cannot be distributed by mail. The Security Office can be reached at (843) 671-1343. During tournament hours, the taxi cab and UBER designated drop-off location is The Shops at Sea Pines Center. After hours, taxi cabs and UBER will be able to pick up at locations around the Harbour Town Golf Links once tournament play has ended. Starting on the 1st tee. 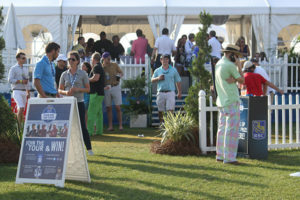 Plaid Nation Contests on the Heritage Lawn – noon-2 p.m. Contests include Hole-in-One and Fastest Clad in Plaid competitions, Tartan Trivia and overall Best Dressed in Plaid. Trophy presentation – 18th green – immediately following the close of play. * Tournament tickets are needed for all special events. All times are subject to change. PGA TOUR LIVE: Thursday and Friday, 7:30 a.m.-3 p.m. (Featured Groups); Thursday and Friday, 3-6 p.m. (Featured Holes); Saturday and Suday, 3-6 p.m. (CBS Simulcast).